I have been sailing now for just short of 50 years. I’m not sure how that is possible, but it happened anyway. In that time I have owned 11 sailing yachts ranging from 25 to 42 feet. The size was not progressive from small to large as you might imagine. The sizes went 35-30-25-34-42-30-34-29-37-37-30-37. If you count that list you will find 12 items. That is because I bought the same boat, the Hanse 371 Tangleberry, which we have now, twice. The first boat I bought was a 35′ Piver Lodestar trimaran called Moonraker, and although I enjoyed it greatly, the 20′ beam had many disadvantages. Despite propaganda about how hast trimarans were, I rarely out-sailed my friend Bruce’s heavy displacement Alden 33, Tamar. This was a live-aboard boat, for which I paid $18,000. At that time you could buy a modest house in Vancouver for about the same amount. Guess which was a better investment. Boats are not investments. Of all the boats I have owned, only one sold for more than I paid for it, and that math only works if you don’t count the large sums I spent on it in the 3 seasons I used it. So a boat is an expense and a depreciating asset. Maintenance is costly, but not keeping it up is even more costly, perhaps even costing your life. Wait, I’m a bit off topic here. Back to the perfect size. Due to careers as a software developer and yacht designer (guess which pays better) I eventually grew affluent enough to afford more or less whatever size of boat I wanted. OK, not a mega-yacht, but I never wanted one of those anyway. In addition to the boats we have owned, I have had the opportunity to sail aboard boats as big as 120′ and even single-hand a 65′ boat for a day. In my 20’s the 25 foot folkboat Eclat was the most fun, but I went aboard a sister ship recently and realized my body is no longer flexible enough for sitting headroom and a low boom. For 12 years we sailed the 34 foot flush deck varnished mahogany and teak Stradivarius. It was fast and fun and tippy. But one day I put my foot through the deck. That is when we bought the Pearson 424 Shamrock, down in Florida. A big heavy comfortable boat which was easy to sail with in-mast furling, and faster than it looked. 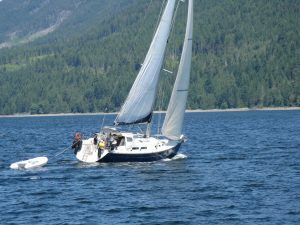 A move back to Vancouver, and we sold Shamrock, taking an Islander 30 in part trade. We called it Katinka. It was a good boat but had seen better days. 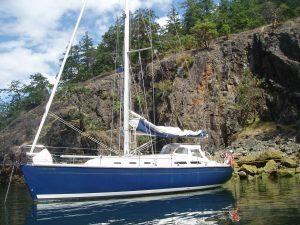 We only used it two seasons then bought a brand new Catalina 34. That boat was comfortable and sailed *okay* but was neither robust or fast enough for my taste. Skipping ahead a couple of boats we got Tangleberry, the Hanse 371 in 2002. I had sketched up my “ideal” cruising boat and it was very, very close to the Hanse. Thanks to the internet I discovered Hanse in eastern Germany and flew to the factory with my son to have a look. We liked what we saw, particularly the very strong construction. 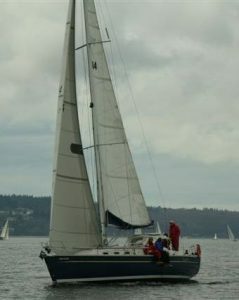 I bought the 371, then a new model, without sailing it, based purely on my technical evaluation. I expected it to sail well, but it was even better than expected. The first one we got had three cabins, I imagined that each of our two kids would need their own cabin, but by then they were teenagers and lost interest in sailing with us. Someone who wanted three cabins bought it and we got Tangleberry, the same boat with 2 cabins and a huge storage area where the other cabin would have been. Tangleberry is easy for a couple to handle. but big enough to take another couple along when desired. It drinks eight, dines six, and sleeps two or four. For us it is the perfect size. 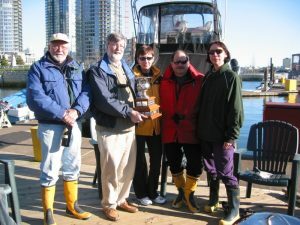 We have used it a lot, including winning races and many long cruises, including to Alaska in 2008. In a week moment, I put Tangleberry up for sale in 2015 thinking of chartering, She sold fast! A major mistake on my part. Within months I had withdrawal symptoms. We bought a 30′ boat, an S2 9.1. Bobo was a great boat, but we found it less comfortable and harder work to sail despite the smaller size. Think no anchor windlass, non-self-tailing winches and no self tacking jib. On cold days we missed Tangleberry’s Espar furnace. In 2017 we decided to get a bigger boat. We looked at newer Hanses and Jeanneaus but didn’t like the Ikea style interiors now in vogue. I fired and email off to the new owner of Tangleberry, asking if he was interested in in selling. Due to a move to the BC interior, he was ready and in a matter of days she was ours again. This year I raced her in 3 single-handed races, and won 2 of them. I bought new sails and some new equipment to make handling easier. I recently read and article in Yachting Monthly in which the writer explains why at age 70 he sold his 50′ boat and bought one the same size as Tangleberry. I’m convinced it is the right size for a couple who have experience and want to enjoy cruising without undue hardship. 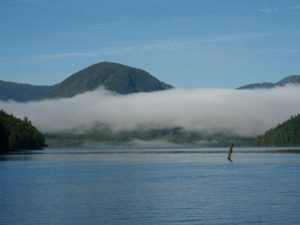 We are leaving this weekend for a three week cruise to Desolation Sound and points beyond.